BRISBANE archdiocese’s Filipino community chaplain Fr Marce Singson is fielding desperate calls as the full extent of devastation from super Typhoon Haiyan emerges. Fr Singson, a Benedictine priest, is also trying to get details of the wellbeing of his own family – he has 12 siblings and 17 nephews and nieces living in various parts of Leyte, one of the hardest hit provinces. After trying all weekend to contact his relatives, in between calls from worried members of the 30,000-strong Filipino community in Brisbane archdiocese, Fr Singson managed to make contact. “Around about two this morning (Monday, November 11) I managed to reach one of my brothers,” he said. The scraps of news Fr Singson managed to gather painted a grim picture. “As far as I can make out all my siblings have had their houses wiped out,” he said. “There’s no food or water in evacuation centres. The monster storm, estimated to be one of the biggest ever, hit the Philippines on November 9. Packing winds of more than 330km/h, with a diameter about 800km wide, Typhoon Haiyan caused a storm surge of six metres, swallowing many coastal towns. At least 10,000 people were believed killed in the Leyte province alone with about 70 to 80 per cent of buildings in the typhoon’s path destroyed. Among the dead was former NSW priest Fr Kevin Lee, living in the Philippines with his wife when the typhoon hit. Survivors reported seeing many corpses scattered along streets. 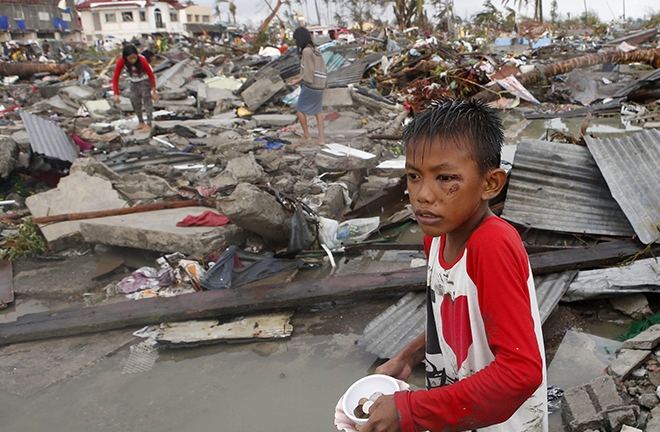 The devastation was far worse than Typhoon Bopha which killed more than 1000 people last December. Typhoon Haiyan made landfall in Vietnam on Monday, November 11, but had weakened significantly. Caritas Internationalis, one of the largest humanitarian networks in the world, has committed more than $1 million to relief efforts through its member organisations. Caritas Australia has committed $100,000 so far. Fr Singson said an appeal to help the devastated regions had been launched on Sunday, November 10, at St Flannan’s Church, Zillmere. He called for prayer and donations to support the Filipino community. Fr Singson also expressed confidence in the resilience of those affected. “It’s our signature as Filipinos that the more we are devastated the stronger our faith grows, the more we gain strength,” he said.